This is the sequel to my article on AC's history prior to World War 2. Articles and commentary on AC have often unfairly belittled their efforts and achievements. This sometimes stems from a lack of understanding of the AC company during its long period of ownership by the Hurlock family (1930-1986). The Hurlocks already had a successful business concern before they took over AC, and had not originally intended to continue AC car production. AC production then became more like a hobby, than any great scheme for success in the motor industry. This enabled them to build high quality cars without compromising design to cope with production techniques associated with larger volumes. While production of the 2 Litre Saloon was in full swing (described in detail in my "Development & History" section), AC's design engineers were busy working on projects for the future. There were rumours of a high-performance car in the making as well as, possibly, an eventual replacement for the 2 Litre Saloon. Central to any new developments, was work on a new horizontally opposed engine. One of AC's new design engineers, Zdzislaw Marczewski (ex-aero industry) was responsible for this engine project, but with the limited resources of AC, progress on the design was long and drawn out. Therefore, I'll be returning to it from time to time between other AC models. Since the war, AC had a factory at Taggs Island, London, as well as the car factory in Thames Ditton. AC had made aircraft parts and fire-engine coachwork, among other things, during the late 1930s up to just after the war. Then, in the late 1940s, they were commissioned by the government to produce a 3 wheeler invalid car. These were initially built at Taggs Island before production had to move to another site at Hampton Court. Thousands of these vehicles were produced by AC over many years. Some people refer to this side of AC's car production as a symptom of desperate trouble in the company, but this was certainly not the case. Another 3 wheeler that AC built was the "Petite". Introduced during that period in the 1950s when there was a great demand for micro-cars - a demand that intensified during the Suez Canal crisis and petrol rationing. A few thousand of these little economical cars were constructed, but it is reputed to have much of AC's traditional high build quality and competent design. Other AC products have been railway related, including rail-buses and also the little narrow-gauge passenger trains for the pier at Southend. By 1952, the basic price of AC's 2 Litre Saloon had topped the critical £1000 threshold, which took it to a much higher tax bracket. Sales dropped off as a result, and so there was more pressure to progress with design work for any new models (although AC Petite production was in progress by this time). An opportunity arose for a stop-gap model when AC's management heard about John Tojeiro's sports-racing cars, checked it out, and struck up a deal to put it into production. Tojeiro joined AC, along with Vin Davison who already had experience of constructing Tojeiro specials. The AC version received various design changes to make it more practical for the road, and legal too. The chassis was largely of tubes in a simple ladder-frame arrangement: 2 longitudinal tubes, a tube cross member in the centre and additional framework at each end. It was quite an efficient light-weight design, although probably not especially stiff in torsion, but the suspension mounting appears to have been very rigid. The engine sat well back, allowing a rigid framework to support the front suspension. Independent suspension front and rear was by transverse leaf springs and lower wishbones, similar to that used in Cooper racing cars. With independently sprung rear wheels, it had sure-footed road-holding over bumpy surfaces. AC installed their trusty 2 litre engine, slightly uprated to 85bhp. This was enough to give 103mph and an 18 second standing quarter mile (0-60mph in 11.4 seconds). The kerb weight came out at 16.5cwt (840kg) with 54% on the rear wheels. The model name "Ace" (previously used in the 1930s) was applied to this new sports car. Bodywork was hand-crafted aluminium, as was AC's tradition, wrapped over small diameter steel tubes making up the framework. On such a small car, wood frames would not have been practical, because wood's high strength-to-weight ratio relies on large section components. This car was launched at the 1953 London Motor Show and went into production the following year. The Ace, with its superb handling and road-holding, was able to take some class wins in motor sport. Chassis were numbered in the series from AE 01 onwards (AEX for left-hand drive). At the 1954 London Motor Show, a hard top version of the Ace was launched. 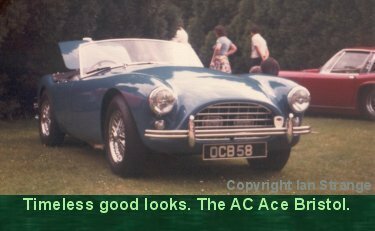 This was not simply an Ace with a roof attached, but had been partially restyled to give the prettiest of lines of just about any small sports car. This was a 3 door hatchback, with wood framing making a partial comeback, for the doors, roof and rear hatch surround. A second tubular cross-member was added to the chassis to help support the final drive, insulated to cut down on cabin noise. The 1920s model name "Aceca" was revived for this beautiful coupé. In 1955, a prototype saloon car was constructed, installed with an experimental flat 4 cylinder engine. This car looked like a stretched Aceca, apart from the general 3 box saloon layout. Progress with the engine still had its problems, but it was later to become a flat 6 engine project. The AC engine was improved and uprated a few times during the 1950s, but its long 100mm stroke and the age of the design (from 1919) meant that there was not much potential for increasing power while retaining reliability. Later AC engines produced about 105bhp. In 1956, a good alternative engine was found in the form of the Bristol 2 litre. A good quality refined engine, like the AC, but with 105bhp (later 125bhp) on tap, and well proven under racing conditions. This fine engine is often mistaken for a twin-cam, but does in fact have 2 widely spaced rockershafts, linked by a set of secondary push-rods. This makes room for intakes to be placed over the cylinders between the 2 banks of inclined valves. The Ace Bristol had straight line performance to match its road-holding. Later examples could top 116mph and achieve the standing quarter mile in 16.8 seconds (0-60mph in 9.0 seconds). Front disc brakes also became an option. Some classic car enthusiasts and journalists believe that one must call this car the "AC Bristol", to ensure one's street-credibility. Some folk have strange priorities! The Aceca's acceleration was slightly slower, but top speed tended to be a little higher than the Ace. John Bolster's road-test of an Aceca Bristol gave the highest results for speed, with 128mph achieved. Chassis for Bristol engined Aces and Acecas had the prefix "BE". The Ace Bristol was quite literally a winner. Without the works backing of many other marques, they took a great many class wins in racing series over in the USA, usually against other European cars. In Britain, Ken Rudd (prolific inventor, engineer and racing driver) campaigned Ace Bristols to more successes. It was Ken Rudd who managed to get an Ace - complete with Bristol engine and disc front brakes - into the world's greatest endurance race at Le Mans in 1957. This particular car also sported a modified front bodywork for improved aero-dynamics. This lone private entry (although assisted by AC) took on the might of big works teams and not only finished, but came in second in class (10th overall). AC were sufficiently impressed to put their own limited funds into a small works team effort the following year. A special Le Mans Ace was designed by Tojeiro, featuring a triangulated space-frame chassis, wishbone/coil-spring front suspension and swing axles at the rear. It had a special streamlined body and the whole car was very light in weight. Special chassis number allocated was LM5000. This was accompanied at Le Mans by a more or less standard production Ace, which in fact kept in fairly close company with the special Ace. The cars finished 2nd and 3rd in class - 8th and 9th overall. In 1959, it was back to the job of a lone privately entered production Ace Bristol to see what it could do. As all the competition in the 2 litre class failed or crashed, the little Ace took the class honours, coming in 7th overall. The last of the 2 litre Saloons were delivered/collected in 1958 and there was a need again for a sporting family 4 seater. The "Greyhound" was the result, and although this resembled an enlarged Aceca, it had been designed from the ground up. A new chassis of square tubes. Front suspension was double-wishbones and coil springs. Rear suspension was of coil springs and a system of links similar to a semi-trailing arm arrangement, which saved a lot of space for passenger/luggage use. Front disc brakes were employed. At 14ft. 7in. (444.5cm) long, it was smaller than the old 2 Litre Saloon and also reasonably light at 21.5cwt (1090kg) kerb weight. It had all the interior luxury and high build quality that AC was best known for. Alan Turner (one of AC's design engineers) was responsible for the Greyhound. Sadly, it was to become one of a series of very promising AC products that had its life-span cut short. One trouble being to perfect the suspension and handling before the road-testers got hold of it. Not easy when you are building tiny numbers of cars at the best of times. At least one road tester cast doubts on the rear suspension layout, although semi-trailing arms were to become very popular in both family and sports cars in later years, showing that the basic concept was sound. What the Greyhound needed (as owners worked out) was a more suitable set of radial tyres. The styling of the prototype Greyhound, displayed at the 1959 London Motor Show, was less well received than most ACs had been. 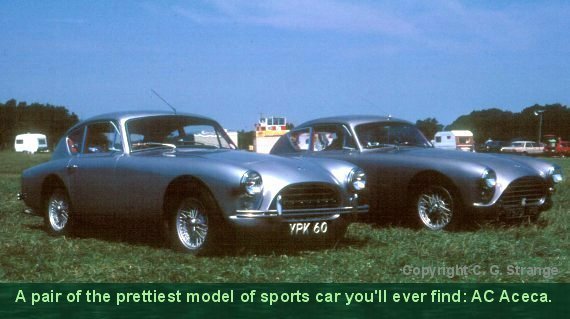 Perhaps partly because it came months after the appearance of the Aston Martin DB4? Turner denied copying anyone else's styling, and it seems far more likely that he was influenced (like so many stylists of the day) by the popularity of many Italian sports cars. The styling was revised for the production cars, including a wrap-around rear window and a smaller front grill - actually an inverted version of the grill from the later Aces. When you actually look all around the shape of the Greyhound (rather than just the profile), it is quite individual. Another question mark to hang over the Greyhound was the choice of engine. Either a 128bhp Bristol 2 litre, or a less powerful but torquey 2.2 litre Bristol was offered. 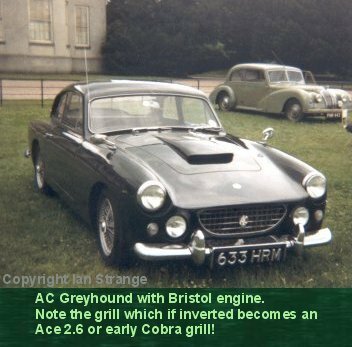 The bad news was that Bristol engines were going out of production and AC had to shop around for a good alternative. A Buick V8 was checked out, but Rover got in their first (darn it! ), and also the Jaguar straight 6 which was a bit heavy for this car. I believe the AC experimental flat 6 was tried in the final Greyhound chassis, although authoritative accounts of this seem to conflict with each other. 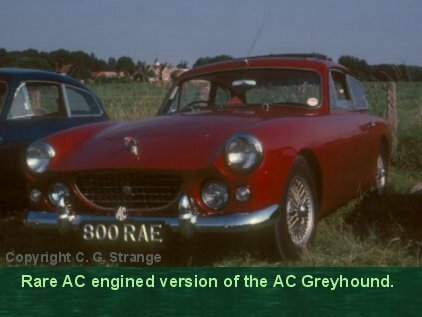 Towards the end of production, a few Greyhounds received the final development of the old AC straight 6, and these cars can be distinguished by the lack of a bonnet-scoop. Sales were pretty slow, no doubt partly due to the indifferent road test reports, plus the lack of a really powerful engine for the car. 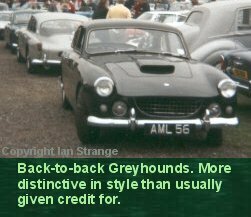 Production of the Greyhound, Ace and Aceca were terminated in 1963 when the factory had to concentrate on building Cobras. Performance of the Greyhound was: Top speed 110mph; standing quarter mile 18.9 seconds; 0-60mph 11.4 seconds. Unladen weight distribution, front/rear, was an almost perfect 50/50. In all, 84 chassis were produced, including 2 experimental chassis: One for the flat 6 AC engine and the other for Ford's 2.6 straight 6. Chassis numbers were mostly prefixed BEF, or BXF for left-hand drive. The 5 AC engined chassis were prefixed AEF, and also FEF for the Ford engined example. Flat Six Prototype... or was it?! While much of the credit for engineering the AC sports cars goes to Alan Turner, Marczewski worked on some design proposals in the early 1960s. One that made it into reality - albeit only one prototype - was chassis number MA-200. It seems that internal conflict between the designers in AC, and their respective supporters, continued into their retirement and later accounts of AC history. MA-200 had long been referred to as the flat 6 prototype until it was publicised that it was physically impossible to install that particular engine. MA-200 actually hit the roads fitted with a 289 cu. in. Ford V8, but Marczewski claimed the front chassis was replaced to accommodate the Ford V8 after discarding the AC flat 6. Other accounts, plus archive photos, suggest that it only ever had the V8. Either way, the chassis design differed from anything else AC had produced. It was built up of square tubes into a triangulated space frame. Rear suspension incorporated struts of some kind, while the front wishbone suspension had inboard mounted springs. This project was started in 1962 with the car completed in 1963. This car is not related to the Cobra (apart from the 289 engine used) or any Shelby projects, as has been thought by some. It's styling was very modern and not unlike some Italian styles that went into production shortly afterwards. But this body was styled by AC, and not copying anyone, just in case anyone was going to ask! It's a great pity that the flat 6 engine did not make it into production, since it appears to have been quite advanced in design. Very light in weight, thanks partly to the use of aluminium and magnesium alloys. It produced 165bhp from its 2.4 litres swept volume, but proved very costly to produce when compared to some of the American engines that many British marques were starting to use. Ken Rudd has already been mentioned with regard to the racing of Ace Bristols, having influenced AC's selection of that engine plus the introduction of disc brakes. He came to the rescue again when AC were going through their engine crisis. The Bristol engine was no longer available and the AC engine was getting very elderly. Rudd's "Ruddspeed" business specialised in competition preparation of sports/racing cars, and he had a lot of experience in tuning Ford's straight 6 engine. In 2.6 litre form, it had a cast iron block, but thanks to its short stroke, was not as heavy as one might expect. Ruddspeed offered this engine in a choice of 5 stages of tune, and in all cases, a much smoother and more refined unit than when fitted to the Ford Zephyr. Stage 5 power output was 170bhp, using 3 double-choke Weber carburettors. One of these engines was tried out in a formerly AC engined Ace, with its chassis re-numbered to RS5000. The results in terms of a blistering performance were enough to prompt AC to get it into production. With the lower short stroke engine, AC took the opportunity to restyle the front of the Ace with a lower bonnet line. This was a little like the late 1950's Ferrari Testarossa, or perhaps more like some of the early 1950s Maseratis. The finished shape is now recognisable as the Cobra style minus the flared wheel-arches. If only AC had registered the design! Performance with the stage 5 engine gave a top speed of 135mph, a standing quarter mile time of 16.3 seconds and 0-60mph in 6.0 seconds. 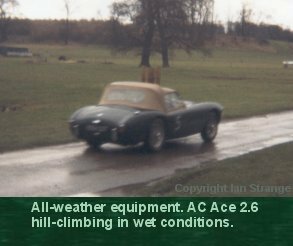 The Ace 2.6, as it is usually known (or Ruddspeed Ace), was launched at the 1961 London Motor Show, but sales were quite slow. Production lasted for only 2 years (again, Cobra production taking over the AC factory), and just 37 Ace 2.6 cars appeared, chassis numbered from RS5000 to RS5036 (RSX prefixes for left-hand drive). A small number (just 8) Aceca 2.6 cars also appeared, although retaining the old body style (chassis RS5500 to RSX5507).